The Nokia Lumia 1320 phablet has been officially announced for Cricket Wireless. The pre-paid carrier has recently been acquired by AT&T and has re-launched 3000 stores throughout the country. Nokia has two models that are considered phablets, and the Nokia Lumia 1320 is the lesser-spec'd model of the two. The device will be a pre-paid exclusive to Cricket in the U.S. when it launches this Friday, June 13th, priced at $229.99 after a $50 mail-in rebate in the form of a Cricket Visa Promotion Card. 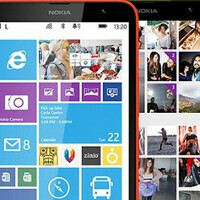 The Nokia Lumia 1320 offers a 6 inch screen with a 720 x 1280 resolution and a 245ppi pixel density. A dual-core 1.7GHz Snapdragon S4 processor is under the hood, along with the Adreno 305 GPU. 1GB of RAM is inside along with 8GB of native storage, and a 64GB capacity microSD slot. A 5MP camera is on back and a .3MP snapper is on front. A large 3400mAh battery keeps the lights on. Every 12 months of on-time payments gives the Cricket customer a $50 credit toward a new phone, and service plans start as low as $35 with a $5 credit for auto-pay. Four lines can cost as low as $100 using a multi-line account. If you haven't checked out Cricket in some time, you might want to look again to see what changes AT&T has brought to the pre-paid carrier. *1.3 MP front cam, guys! Phonearena you forgot to mention that the moto g and the lumia 520 and some others as well are all going to launch at the same time. Way better? How? You could buy two moto gs and still have $30 leftover. Yeah, and right now with Cricket the moto g after rebate is $100. $100 x 2 = $200 $200 < $229 Good going "idiot". well... the Moto G costs $99 on Cricket after the rebate. Anyway, for people already on Cricket, the 1320 is a very nice option. Its better than the Grand 2 IMO. This is a win-win for Cricket and Cricket customers. May pick it up myself. Hmmmmmm... Not a bad way to get one if it's unlockable... I'd rather have a 1520 but a 1320 wouldn't be a bad alternative.